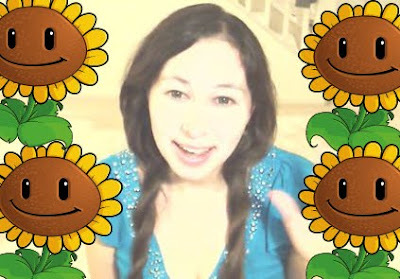 The Daily Zombies: Laura Shigihara's Live Renditions of "Zombies On Your Lawn"
Laura Shigihara's Live Renditions of "Zombies On Your Lawn"
It's undead cuteness overdose as we indulge ourselves in Laura Shigihara's amazingly adorable live renditions of "Zombies On Your Lawn". Being avid gamers as well as Daily Zombies ourselves, we here at The Daily Zombies have had the opportunity of replaying the game ending track of PopCap's Plants vs. Zombies ad-nauseam since its release on the iPhone. And now we bring you two live performance of the adorable track, "Zombies On Your Lawn", written and performed by the adorable Laura Shigihara, who also composed the entire soundtrack of the game. Here's a raw live rendition with Shigihara's boyfriend, George Fan (incidentally the designer of the game) as all the zombies, complete with goofy song and dance. And this one's also a collaboration between Shigihara and Fan during an event on August 2nd, 2010 in San Francisco, CA. Here's the original game ending with the track. While you are at it, do head over to Shigihara's site to listen, or better yet, download the entire soundtrack.